I love a bowl of soup noodles. Whether a wonton noodle soup, ramen, or pho, its one of my favorite things to eat any time of the year. 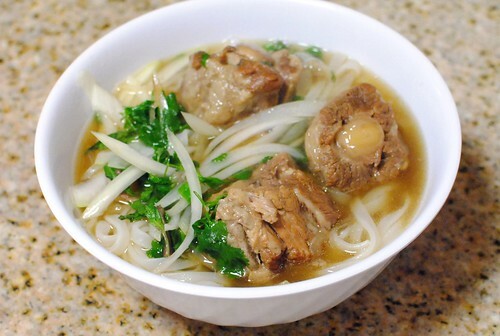 I will admit, I hadn’t had a “real” bowl of pho until I was in my late teens. Not sure why, but I just never came across it in San Francisco. 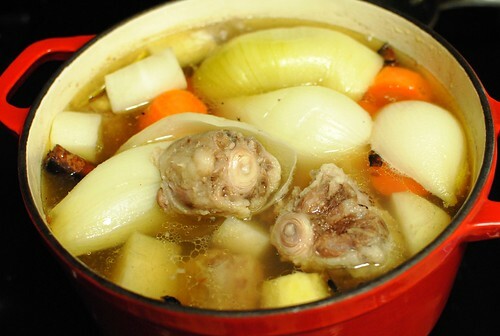 Now, it’s a go-to whenever something warm and comforting is needed, especially on a cold day. 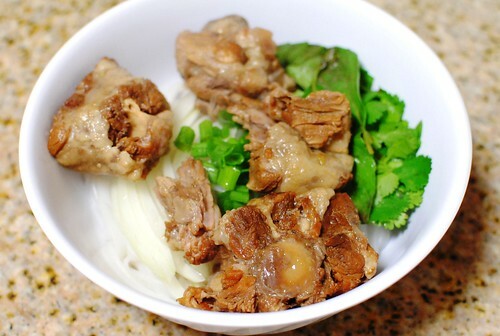 I recently had oxtail pho for the first time, at Pho Lu in Garden Grove. It was delicious; both the meat and broth offered a depth of flavor I didn’t get in a more typical raw beef pho (pho tai). I was inspired to make something similar at home. I loosely followed a recipe from Serious Eats (here). I have no idea as to how authentic it is, but it looked legitimate enough. The recipe calls for oxtails to simmer for 8 hours (from start-to-finish, the preparation would be over 24 hours)…seriously, this had better be good. I started with about 5 pounds of oxtails from my local 99 Ranch market. They weren’t as cheap as I thought they’d be at $5 per pound. Not sure how this dish is so reasonably priced at restaurants. I began by soaking these tails overnight, changing the water often, to remove any blood and impurities. Further, I blanched them quickly before starting my simmer. I didn’t really measure much of anything, but I dropped in toasted spices (cinnamon and star anise), roasted onion and ginger, as well as carrots, daikon and lemon peel. Combined with the blanched oxtails, water, fish sauce and sugar, I was ready to let my broth simmer for a good 8 hours. I’ll admit I tried the broth after the 8 hours and felt skeptical. It tasted off, really unbalanced with a strong anise flavor. Dammit. I drained the soup and let it sit in the refrigerator to cool so that I could scoop out the globs of fat settling at the top. Hopefully the flavors would mix together better after they cooled. The next day I was ready to assemble the final product. I started by reheating some of the oxtails in the soup. 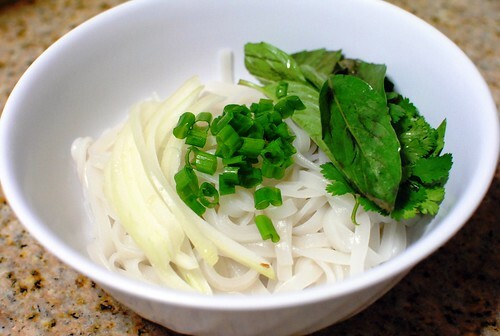 While doing that, I cooked some dried pho noodle (I prefer the thicker one) and dropped them into a bowl with some thinly-sliced raw onion, scallions, cilantro and thai basil. 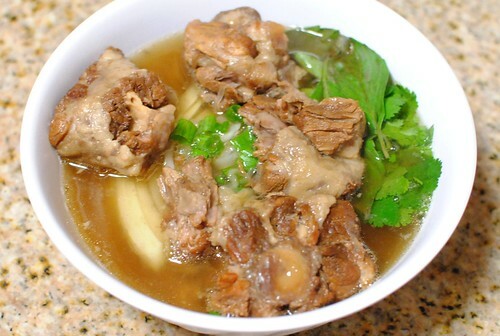 Finally, I placed the oxtails on top and poured in the broth. How was it? It was good. Not great, but good. I thought the soup needed better balance (thankfully, the flavors mellowed out and it wasn’t as bad as my first taste) – maybe I should’ve measured a few things out. Too much star anise. Shouldn’t have substituted lemon peel for lime. However, the oxtails were delicious, just as I expected them to be. Tender and just about falling off the bone, they had just the right amount of meat, connective tissue and fat. Overall, I was proud of this bowl, especially for a first time. Will I make it again? Maybe, but it will be a while. I think the cost of my raw ingredients were higher than if I just ordered it at a restaurant, not even including the significant labor. Still, there was something comforting and satisfying about making something like this at home, so I suspect I will do it at some point. Too bad! I was so excited when I read your tweets about making this – I wish it had turned out to be mind-blowing-amazing. I think the price of oxtail has gone up now that it’s a “trendy” item at restaurants. I think it used to cost $0.99/lb. Haha trust me, I wanted it to be amazing too! Yeah seriously, that has probably driven the price up…though the other trendy cheap cuts (pork belly, short rib) seem to still be more reasonable. Even though the end product wasn’t perfect, damn good job for your first try, Darin. 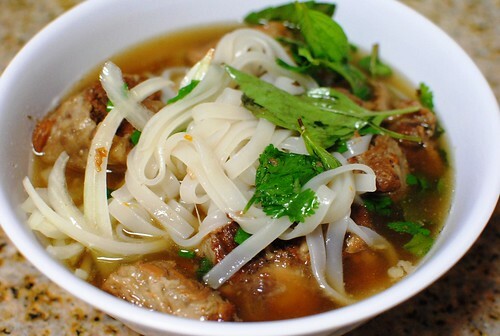 I’ve yet to muster the guts to make Viet noodle soup at home. I will share Grandma’s recipe once I learn it. No lemon or lime peel, I’m pretty sure. Thanks Cathy! I look forward to you going on that adventure. Oh, man. I feel you. Even if something as time consuming as this is doesn’t turn out exactly the way you want it to, there’s pleasure in the process and completion. And it looks pretty darned good anyway, and now you know what you should tweak for next time! I know, right? I developed a relationship with that bowl of soup by the time it was ready to eat! But yes, it was a good learning experience.